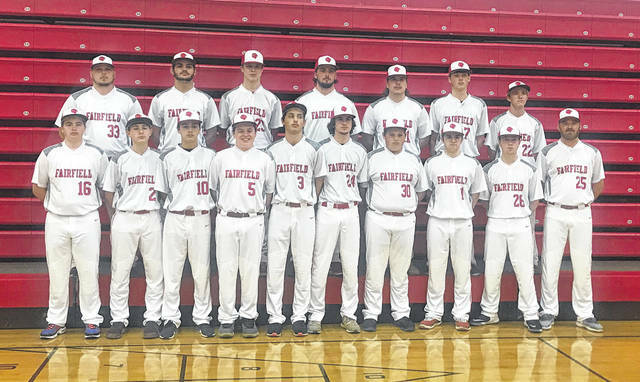 The Fairfield Lions varsity baseball team poses for a team photo on Tuesday. Pictured front row (l-r): Lane Sparks, Logan Rohde, Jacob Morgan, Ryan Ludwick, Nathan Vidourek, Wyatt Willey, Zane Acton, Orrie Friend, Hunter Burns and Head Coach Jeremy Andrews. Back row (l-r): Assistant Coach Jason Fox, Hunter Burns, Sam Buddelmeyer, Griffin Irvin, Layne Morgan, Ethan Grooms and Austin Setty.